McGill will receive over $27 million from the Natural Sciences and Engineering Research Council (NSERC) for a wide range of long-term research projects, including studies on the texture of foods and biomaterials; holographic approaches to black holes; the treatment of malaria; and research into the role of sleep in the intellectual development of children. McGill will receive more than $27 million from the Natural Sciences and Engineering Research Council (NSERC) for a wide range of long-term research projects, including studies on the texture of foods and biomaterials; holographic approaches to black holes; the treatment of malaria; and research into the role of sleep in the intellectual development of children. The Honourable Ed Holder, Minister of State (Science and Technology) announced today the results of the 2015 competition for NSERC’s Discovery Grants, Discovery Accelerator Supplements, Discovery Development Grants, Alexander Graham Bell Canada Graduate Scholarships, Postgraduate Scholarships, Postdoctoral Fellowships and Research Tools and Instruments Grants at the University of Ontario Institute of Technology. Across Canada, the government will invest more than $340 million in support of over 3,800 researchers and students. 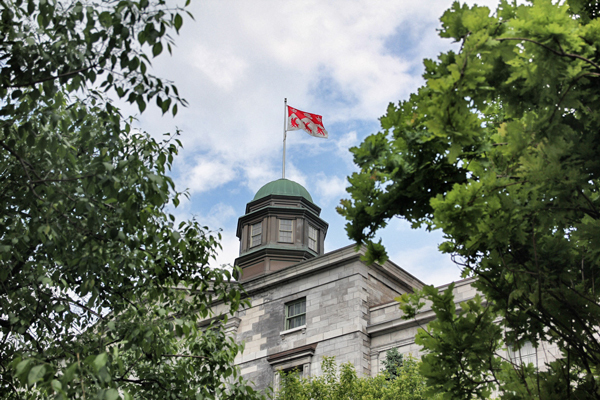 McGill ranked first among all Quebec universities, and rose to third place among all Canadian universities from fourth in 2014, in terms of total research funding granted in this competition. Seventy-one per cent of all McGill applications were successful in this round, a six-point lead on the national success-rate average. Through these grants, over 120 McGill researchers will receive significant funds to support the costs of ongoing programs of research with long-term goals. Recipients include some of the University’s most senior researchers, as well as new faculty members. The Alexander Graham Bell Canada Graduate Scholarships and the NSERC Postgraduate Scholarships and Postdoctoral Fellowships, which provide financial support to high calibre scholars engaged in a doctoral program in the natural sciences or engineering, were also announced today. Ninety McGill postgraduate and graduate students will share in a $77.8 million federal research funding pool. Professor Ehab Abouheif, Department of Biology: Eco-Evo-Devo and the origin of novelty in complex biological systems. Professor Jan Adamowski, Department of Bioresource Engineering: Novel Approaches in Statistical Analysis and Coupled Social-Physical Systems Modeling for Integrated and Adaptive Water Resources Management in the Face of Increasing Uncertainty. Professor Louis Collins, Departments of Neurology and Neurosurgery and Biomedical Engineering: Framework for multi-feature registration of medical images. Professor Julie Coté, Department of Kinesiology and Physical Education: Biomechanical Modeling of Posture and Movement Coordination: Fatigue, Gender and Aging effects. Professor David Frost, Department of Mechanical Engineering: Fundamentals of Metal Particle Combustion for Energy and Loss Prevention Applications. Professor Irene Gregory-Eaves, Department of Biology: Community and ecosystem dynamics of north temperate shallow lakes during the Anthropocene. Professor Stephen McAdams, Department of Music Research: Perception and cognition of musical timbre. Professor Jérôme Waldispühl, School of Computer Science: Computational methods and integrative approaches to predict 3D structures of large RNA molecules.